Last week Helen Patterson died following a year long battle with a rare sarcoma. She leaves Paul and five children. She was a Prostate Cancer Oncology specialist in Cambridge. I was privileged to know her as a colleague and as a crew mate. Helen believed passionately in empowering women through sport. She was a well known rower in both Cambridge and Oxford and an accomplished runner. Even as her disease progressed, she completed a half marathon for prostate cancer last October and was still running in January. 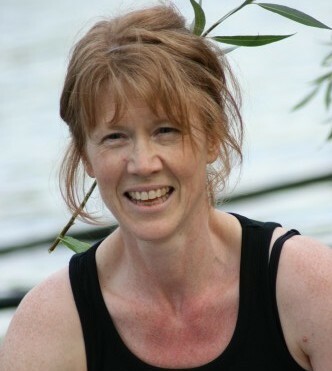 Helen rowed for the Oxford Lightweights in 1985 where she was first given her life-long nickname “HP”. That year, her crew lost their race against Cambridge, but her college crew, Osler House, went on to win the prestigious Head of the River blades in the Oxford Summer Eights, (like Cambridge Bumps). She joked about having to keep this ‘dark side’ a secret from us when she first arrived in Cambridge. Helen’s first rowing coach was “Nick the monk”, a Dominican Friar and pretty gorgeous by her accounts, (she admitted his unobtainable status added to the attraction!). He used to come to boat club dinners dressed in his habit. He also used to entertain the crew to informal ‘American Suppers’ at the Friary, you can imagine the effect of nine women on his fellow young celibate men. Helen used to develop complicated medical theories of how they should be training physiologically, in those days if you hurt a lot it “must be doing you good”–physiology-based training was very much an emerging field–and she used to take Nick to task if she thought he wasn’t pushing them hard enough. After circuits, they would roll the tops of their shorts down to compare “love handles”, hoping to see that they had got smaller. Helen possessed a wicked, medical, dry wit and competitive instinct which helped to bond whatever crew she was in. It was her antidote to grueling training. She once admitted that during seat racing selection, she perhaps adjusted her effort just a tad depending on the personality of the incoming seat racer–they had to fit emotionally and sense-of-humour-wise as well as row well in her book! The twinkle in her eye and amazing honesty was what we all loved about Helen. Helen joined Champion of the Thames in 2006 when her youngest child was a year old. Helen valued the rowing/work/life balance that Champs offers. While Helen rowed in the women’s 1st crew, they gained the highest station ever achieved by the club in the Bumps. With ever increasing workload at Addenbrooke’s Hospital, in 2007 Helen moved to the 2nd crew and became an essential part of the team, gluing together the disparate talents of the other ex-1st-boaters. She was the one who taught us to “box clever”: row well, efficiently and play to our strengths. This was a very special 2 year period for the crew as we gathered force and momentum, winning Vesta Veterans, National Masters and having our first taste of Henley. At the start, Helen had to sit out and coach us for these races as she already had rowing points. Once we lost our novice status, she encouraged us to try Henley Masters. The fact that we had 28 children between us was not going to stop us flying! Sir Steve Redgrave even came to give us a hug–the “fecund pub crew” from Cambridge that raced (and lost of course) against the ex-Olympic Gold medal winners of Agecroft. It was Helen’s belief that we could try–and enjoy trying–that made us stop worrying about only being a “pub crew”. To her it was a given that whatever you put you mind to, you could accomplish and enjoy. Helen’s “joie de vivre” is sorely missed, she kept us focused and demanded we try for each other. Even when she was too ill to row, we continued to do our “Helen tens” when we needed to focus and drive hard. On my last visit to Helen, 10 days before she died, she wanted to know all about every one of “her” crew: our children and our lives. In the entire time of her illness, she never once ranted about how unfair this disease was, she just wanted to make her time on this earth count especially for her family and her friends. I would say her mission was accomplished well, with great style and huge empathy at home, on the water and in her work. Helen will appear on the remembrance page at the Arthur Rank site every year at this time. The book will be available at the funeral and afterwards at Churchill.